I don't imbibe so much myself. It's how recipes like Sautéed Apples are developed. But I can't help accommodating the Fanatic's Resident Eater with the stuff of his dreams. 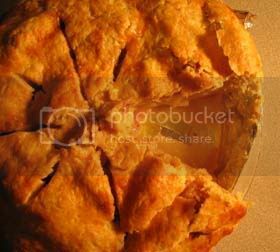 1 Prepare a Basic Pie Crust. 2 Wash, peel, core, and slice apples. Place apple slices into a large bowl, a very large bowl, the biggest bowl you can find. Note: I used all but three Gala apples from this picture. 3 Combine sugar, flour, spices, and salt. Toss sugar mixture with apples. Sprinkle lemon juice and apple cider over apples and toss again. Note: I have tried over the years making apple pie with less sugar. I was pleased with the taste, but it seemed the apples always turned mushy. The sugar performs more than a sweetening function I discovered. It creates a hypertonic solution for the apples. That means the fruit will stay firm and retain its color as it cooks. So, don't be tempted to scrimp on the sugar. 4 Remove one pie crust square from refrigerator. Allow to warm for about 5 minutes to assist rolling. Place onto the middle of two overlapping sheets of plastice wrap, and cover with two overlapping sheets of plastic wrap. Roll through the plastic wrap into an approximately 13-inch round. Peel off top wrap, position dough over pie pan, and peel off bottom wrap. Press dough gently into pan. Leave overhanging dough in place. Note: Although this process keeps plastic wrap manufacturers in business, it's an efficient way to work pastry dough. There's no sticking to your rolling pin or the counter, you won't heat the dough by handling it directly, and it's easy to place into the pie pan. There's just one trick to the plastic-wrap roll: Peel the wrap off and replace it periodically as you roll (both top piece and bottom piece) to prevent stretching the dough instead of rolling it. 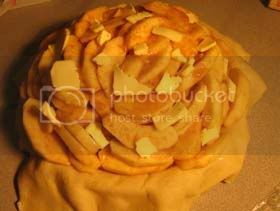 (Stretching will produce a tougher pastry.) You can easily flip the dough, rearrange the plastic, roll, and flip again. 5 Preheat oven to 425°F. 6 Remove remaining dough from refrigerator and roll into a 13-inch round as described above. 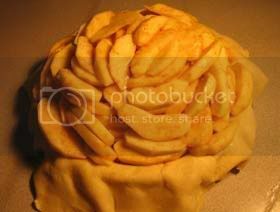 7 Toss apples a few more times and fill pie pan. 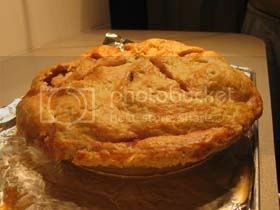 This quantity of apples will need to be arranged tightly to fit, but the resulting well-filled pie is worth the effort. 8 Dice 2 tbsp. butter into about 20 pieces. Dot apples with butter. 9 Cover apples with second crust. Fold top crust overhang under bottom crust overhang. 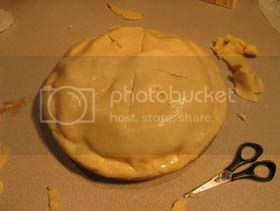 (You may need to cut the bottom crust so it is about ½ inch shorter than the top crust.) Flute, pinch, fork, or otherwise seal the crust edge. Make slits in top crust. (Be creative!) Brush top with egg-white wash.
10 Place pie onto a cookie sheet or line bottom (or bottom rack) of oven with aluminum foil to catch drippings. Bake at 425°F. for 15 minutes. Reduce oven temperature to 350°F. and bake for an additional 45 minutes or until top is golden and apples begin foaming through the slits. 11 Cool for several hours before cutting.